World Ranger Day both commemorates Rangers killed or injured in the line of duty and celebrates the critical work Rangers do to protect the world’s natural and cultural treasures. World Ranger Day is observed annually on the 31st of July and is celebrated by the International Ranger Federation’s (IRF’s) member Associations, The Thin Green Line Foundation, and by organisations, schools and individuals who support the work of Rangers and the IRF worldwide. The first World Ranger Day was observed in 2007 on the 15th anniversary of the founding of the IRF. Let’s pause for a moment to reflect on the sacrifice that these Rangers make; to honour the fallen Rangers and their colleagues who still bravely undertake their role in the field. Host a public or private event dedicated to the work of Rangers and screen the international Ranger documentary, The Thin Green Line. Apply online. 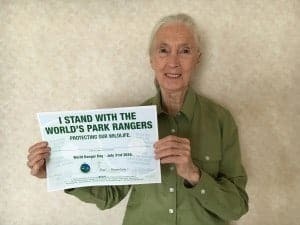 World Ranger Day Poster (PDF) – Put your name and location on the sign, have your picture taken whilst holding the poster, or take a photo with Rangers or in a protected area, and post it on social media sharing the photo to the IRF and the TTGLF Facebook pages using the hashtags on the sign. Raise funds to support Rangers and the work of the IRF, through its charity arm The Thin Green Line Foundation. Donate here. Paul Simon’s Open Letter in support of Rangers! (Copyrighted. Please do not reproduce any part or upload elsewhere as per express wishes of Clarence House.